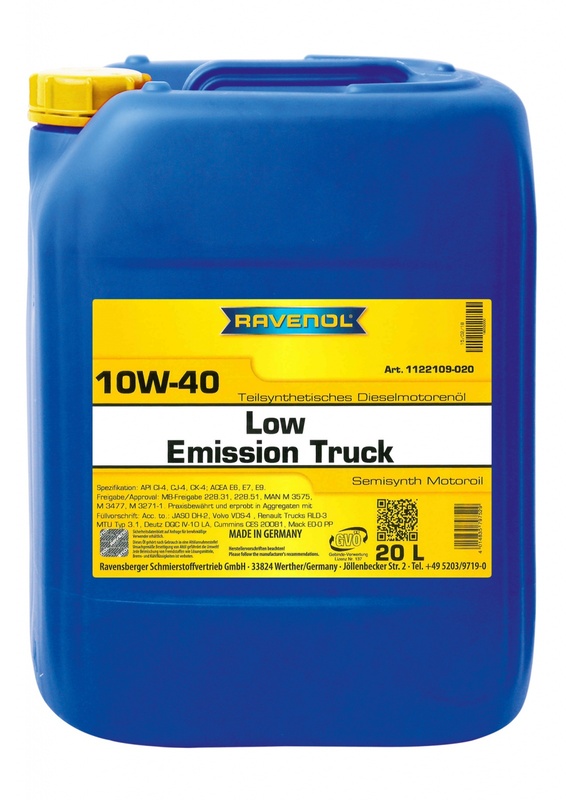 RAVENOL Low Emission Truck SAE 10W-40 is an all-season multigrade SHPD engine oil (Super High Performance Diesel) for heavy duty commercial vehicle diesel engines which has been developed to meet the exhaust emission standards for Euro V and Euro VI. It reduces friction, wear and fuel consumption and provides for longer oil change intervals in turbo diesel engines. The shear stable additives improve performance, reliability and the cleanliness of the engine. RAVENOL Low Emission Truck 10W-40 is a year-round high performance engine oil, especially designed for economic use in Euro V and Euro VI engines with after treatment systems. It is suitable for use in extremely heavy duty commercial vehicle diesel engines.